You’ll never, never believe it! 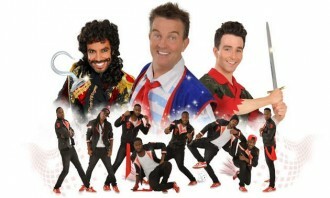 After 7 years Milton Keynes’ most popular panto star ever, Bradley Walsh is back! Taking a break from our TV screens in hit series’ such as Law & Order UK and The Chase, your favourite funny man Bradley is set for a spectacular return to MKT after smashing Box Office records in Cinderella (2006) and Aladdin (2007)! 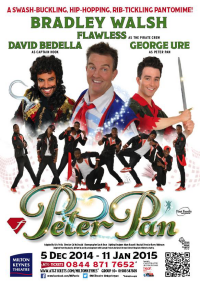 Leading an all-star cast as Smee, Captain Hook’s hapless first mate, in the tale of Peter Pan, this year’s pantomime will be a magical delight for families of all ages– and there will definitely be some fun to be had for those big kids who never grew up! Joining Bradley on the decks of the Jolly Roger after soaring to fame in Britain’s Got Talent will be Street Dance sensations Flawless as a group of pop-locking, hip-hopping pirates as you have never seen them before. With a national tour with English National Ballet and two hit movies under their belts, expect to see some ‘moon-walking’ the plank with this motley crew! Get ready with your loudest boo and hiss, as no panto is complete without its dastardly villain, and there is no bigger baddie in all of Neverland than this year’s Captain Hook, David Bedella (Rocky Horror Show, Jerry Springer The Opera). Don’t miss out – Hook your tickets now!